We’ve all seen enough three-hanky movies to know that romance begins and ends with the right setting—sublime enough to inspire sighs, but not so jaw-dropping that your own assets get overlooked. 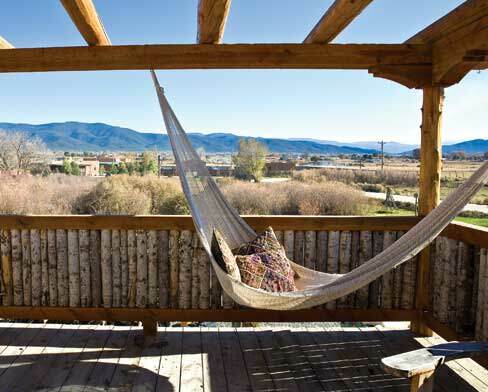 Mix in the stimulation of Taos’s unique cultural landscape, 70 miles north of Santa Fe off N.M. 68, and you have the ideal setting for focusing on each other. The most crucial setting, of course, will be within four walls, for which the secluded Adobe & Pines Inn, south of Taos, provides the necessary props: fireplaces, whirlpool tubs, in-room massage, gourmet breakfast, and idyllic grounds with bubbling stream and a view of Taos Mountain. Equally poetic in Taos itself are the three exquisitely appointed adobe casitas of Casa Gallina, where innkeeper Richard Spera ushers in guests with wine and hors d’oeuvres, and supplies optional gourmet meals from his organic garden. Both inns offer so many in-room amenities—movies, tunes, kitchens, private courtyards—that you may never want to step off the premises. If exuberance does strike on Saturday, nothing awakens dormant passions like a walk in the woods (trust me). Your guides at Wild Earth Llama Adventures do the rest, with a gourmet picnic lunch packed in by llamas. If you find your hearts are soaring, a hot-air balloon flight may be more your altitude. The Pueblo Balloon Company provides scenic flights over the Río Grande Gorge, and offers a champagne toast to celebrate. Or try a drive up to the Village of Taos Ski Valley for an early-evening cocktail, or catch the sunset from the Río Grande Gorge Bridge—a view that is literally breathtaking. For the ultimate in privacy, reserve one of the three boudoir-like booths—just the setting for a diner who might have an important question to pop. If You Go: Adobe & Pines Inn, 4107 Road 68, Ranchos de Taos, (800) 723-8267, www.adobepines.com; Casa Gallina, 613 Callejon, (575) 758-2306, www.casagallina.net; Wild Earth Llama Adventures, “Take a Llama to Lunch!” day hike, $99, (800) 758-5262, www.llamaadventures.com; Pueblo Balloon Company, flights $225, (575) 751-9877, www.puebloballoon.com; Lambert’s of Taos, 309 Paseo del Pueblo Sur, (575) 758-1009, www.taosrestaurantgroup.com/lamberts_of_taos; The Love Apple, 803 Paseo del Pueblo Norte, (575) 751-0050; Joseph’s Table, 108A South Taos Plaza, (575) 751-4512, www.taosrestaurantgroup.com/josephs_table.